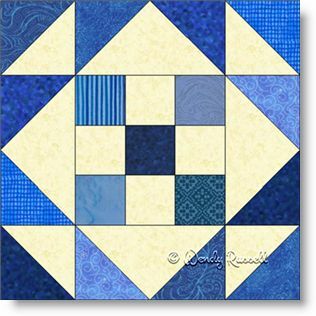 The Flying Diamond quilt block is kind of a "double nine patch" as the centre is made of a small nine patch block and then it is extended into a larger nine patch block by adding half square triangles in the four corners and flying geese patches as well, in the outer rows. This simple quilt block would be a good choice for teachers to introduce all of these patches as mentioned above. The two sample quilts illustrated are both created with on point settings and as you can see they are very different. Your imagination is all that limits you for creating your own special heirloom.